At the edge of a wildflower meadow with mountain views, this luxury furnished tented cabin has a king-size water bed, sofa and private deck. Each tent has a kitchenette in the lodge, and there is a sweet new bath house. Guests can enjoy wood-fired pizza and the new all natural wood hot tub. Guests can also get fresh eggs from the hen-house located on the property. There is 40 acres of meadows, woods, pond, streams and trails all for guests to explore. Nightly bonfires, star gazing, a nearby lake and rafting in the Hudson River below with a golf cart service to the tent. All glamping tents, are spaciously set apart for privacy yet an easy walk to the Bath House and the Lodge where each glamping tent has its own kitchenette. The tents have a “fly” over them so they stay remarkably cool during the day and completely waterproof. At night, guests can zip up the canvas windows and doors, and stay cozy under handmade feather quilts. The new bath house has a women’s side with two toilets, a shower and double vanity with glass vessel sinks --- matching facilities for the men’s side. In the nearby lodge, there is also a lovely new bathroom with an old-fashion claw foot tub where guests can enjoy a deep bath with lavender salts. Hosts kindly provide nice towels and soap. In the lodge, there are individual kitchenettes for each of the glamping tents. It has a sink, one burner cook-top, coffee maker, compact refrigerator, dishes, cutting board, glasses, utensils, napkins and basics of salt, pepper, sugar. Guests should bring their own coffee and cream. There are open shelves for guests to store groceries. Outside are several charcoal grills and a gas grill. Host will provide charcoal and lighter fluid. Newly built is an amazing all natural cedar hot tub. Located on one of the most beautiful spots of the land, the new Japanese wood hot tub is a delightful treat for guests. Built within a small post and beam temple-like structure with gorgeous views of the mountains beyond and wildflowers below, the spa tub is a wonderful way to relax during a stay. The spa is $25 per person for an hour’s retreat of happiness. Most nights in the summer, wood fired pizza is offered. Hosts make and provide the dough, and guests bring their own toppings. The wood-fired pizza oven is fired up in the late afternoon. By six, the wood fire has died down and the oven is about 800 degrees. Starting around six o’clock and ending about eight, guests can come to the pizza pavilion with their toppings and hosts will help them cook their pizzas. Because the oven is so hot, the pizzas cook in about three minutes. Lots of fun to be had! Hosts requested a donation of $8 / $5 for children to cover costs of firewood, dough, etc. At dusk, host start the bonfire, so guests can relax in hand-built Adirondack chairs to watch the fire and the stars. There is no “light pollution” at the property, so it is an amazing experience to see thousands of stars, night clouds, moonscapes. Guests can enjoy getting breakfast eggs from the hen-house. The flock of chickens and ducks are fun to watch as they free range all over the property. The ducklings enjoy it when there is fresh water run into their little swimming pool --- they are so joyous when they’re in water. The ducks are sweet but shy away from people, unlike the chickens that wander all day and come back together to the coop only to sleep, the ducks are co-dependent and stick together all the time; if one duck is separated, they all quack until they get back together. Country life at the property can be noisy with the chickens cackling and the ducks quacking! The hosts have a dog called Sammy, a lab/shepherd mix, who bounds around the property, visiting all guests, laying down on the porch and steps waiting for people to come home. Guests should be careful coming down the driveway because the dog may sometimes leaps unexpectedly in front of cars all goofy and happy. The cabins are set up for visiting dogs, but unfortunately cannot host dogs in the tents. The lake is three miles down the winding road at the beautiful 13th Lake. Totally natural and quiet with no sign of civilization on its shores. The Hudson River is at the bottom of the mountain with clear beautiful water. Guests can go tubing or rafting with the various rafting companies located nearby. The town of North Creek is five miles away off the main Route 28 road but it’s easy to miss so guests should look for the 3 or 4 signs that mark the entrance to “town”. North Creek is a scenic little town with great restaurants, a grocery store, a liquor store, shopping places and a scenic train called the Saratoga/North Creek Railroad which takes folks in antique train cars along the Hudson River. Another great experience is nearby Garnet Hill Lodge, an historic lodge offering lunches and dinner. This is a beautiful property, with amazing views and great food. It’s located right up the road in North River, where mountain bikes can be rented and have all kinds of walking trails. These delightful glamping accommodation feature wood-burning stoves and an outdoor fire pit for guests to toast marshmallows on an evening. 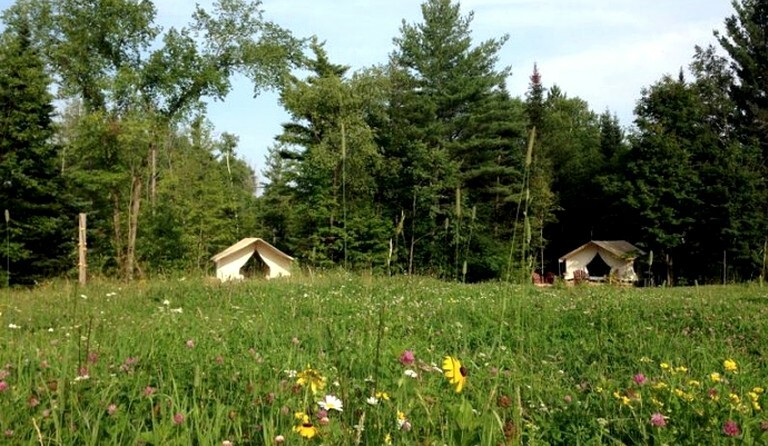 The glamping tents share a common bonfire which is great for getting to know other guests and singing campfire songs. 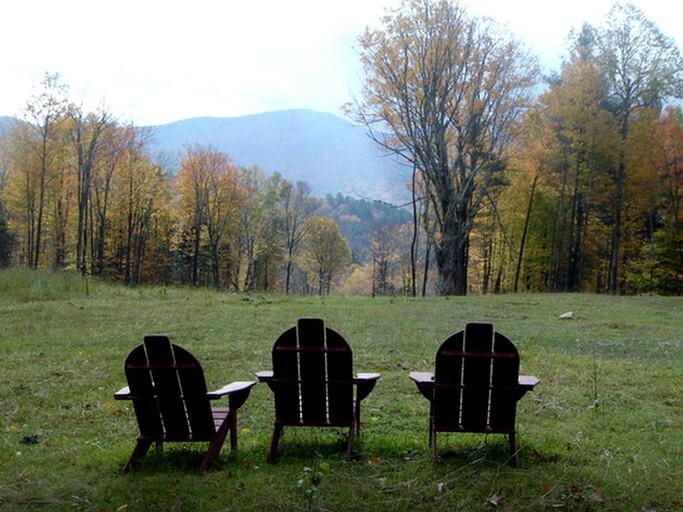 Additionally, glampers can thoroughly enjoy amazing stargazing at night from the comfy Adirondack chairs. The host prefers to get fires going for the guests. The host of this site is very helpful, friendly, and can make recommendations for swimming, rafting, and dining. It is certain that guests will be able to relax and enjoy their getaway while glamping at this property in North River, New York. 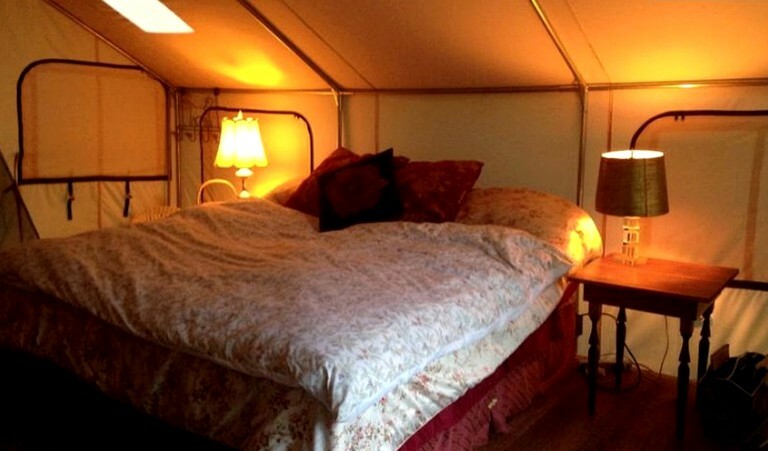 This glamping property is a fantastic location for exploring the outdoors and has acres of great land for walking and enjoying the scenic views. Families are welcome, and kids will have the opportunity to feed a pony and retrieve eggs from the henhouse at the site’s farm. There is a nearby lake that is great for swimming and boating in the summer, and it also has a nice sandy beach to walk along. The land is truly gorgeous, and the site is very private. Guests can rent a canoe or kayak from a local company, or simply sit back and enjoy the surroundings. For a real adventure, there is an aerial zip line course in the area that is safe and exciting for the whole family. The Hudson River is at the bottom of the mountain where guests can go tubing or rafting with the various rafting companies located right nearby. There is also all kinds of hiking at Gore Mountain. Another great experience is nearby Garnet Hill Lodge, which is a historic lodge offering lunches and dinners with amazing views. They rent mountain bikes and have all kinds of walking trails. 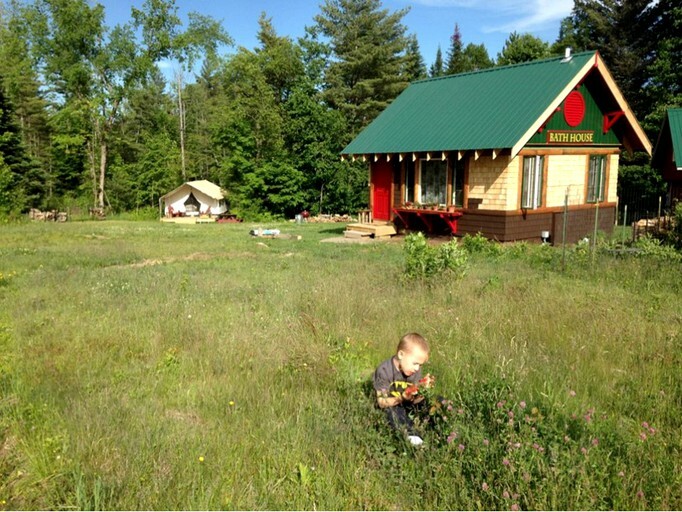 Within the property's 40 acres, there are walking trails, scenic mountain views, beautiful mountains, and wildflower meadows. Gore Mountain Ski Center is off Route 28 in North Creek. Frequently they run the gondola so for about $18 a person, guests can take the gondola to the top of the mountain. Guests here will enjoy incredible views, beautiful fresh air, and an overall lovely experience. Another great experience is nearby Garnet Hill Lodge, a historic lodge offering lunches and dinners on a beautiful property, with amazing views and great food. It’s located right up the road in North River. Guests here can rent mountain bikes and enjoy all kinds of walking trails. Pets are not permitted in the glamping tents. This is a quiet location, and loud music and noises are discouraged.